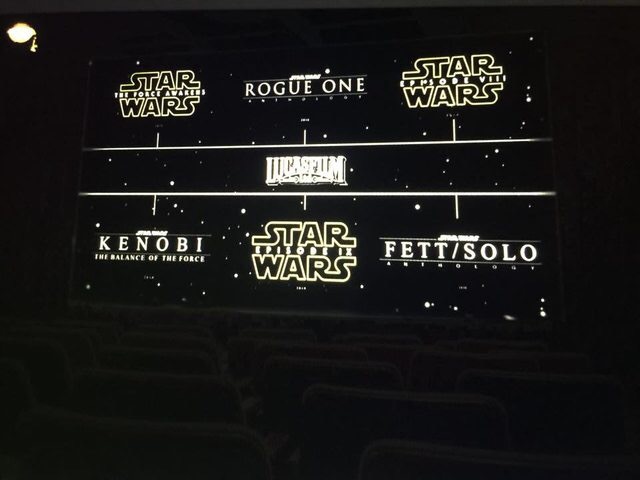 Rumor: Photo leaks with all Star Wars films due out until 2020. This is very interesting if true but it’s also very fishy. Our friends at Indie Revolver have come across a photo supposedly taken at a Lucasfilm meeting that not only depicts an Obi-Wan Kenobi film, but puts that film as being released in 2018. Just yesterday we heard officially that a young Han Solo film would be released in May of 2018. Could Disney be doubling up that year and also releasing a much-hoped-for Kenobi film? We know Obi-Wan Kenobi actor Ewan McGregor has been very vocal about wanting to return to Star Wars but it seems odd he’d be talking about it at all if they were planning the film and already had a release spot for it. Why isn’t the new official Han Solo film coming out on 2018 depicted in this photo? We have every reason to believe the titles are organized by release year and the pictured Fett/Solo film is due in 2020. A further curiosity is that the Kenobi film is not labeled as a part of the Anthology films. I guess we’ll just have to wonder until Friday.